I haven’t written a music post in ages, but I finally have some fresh content worth sharing. I previously wrote about The Rocket Summer opening for Switchfoot at the Georgia Theatre in Athens. As I’d written, his stage presence was phenomenal and I enjoyed the show, but was disappointed by the limited time he had on stage. His subsequent headlining tour, where he would invariably have a longer set list, did not include any stops I would be able to attend. 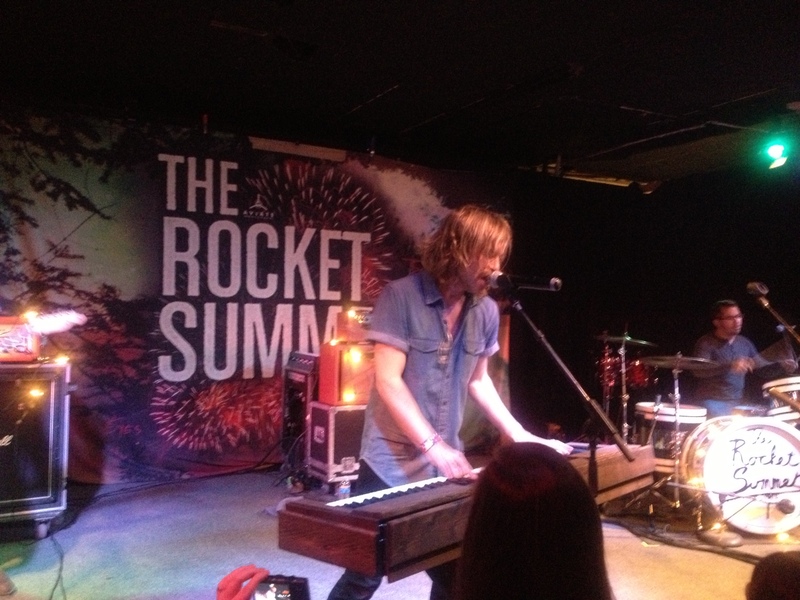 Fortunately, The Rocket Summer has just gone back on tour and stopped in Charlotte, NC on 3/22/13. I was able to make it to the Charlotte show, and as before, his stage presence was great. This time performing in front of his own fans (as opposed to Switchfoot fans) he came off-stage and into the crowd for one song and during the encore joined the crowd to dance in the closest thing to a mosh pit you’ll ever see at a rock/pop concert. The show was in a small venue, the Tremont Music Hall, with only a few hundred in the crowd. After the show, artists from each band were out socializing with the remaining fans and I was able to ask Bryce Avary, the man that is The Rocket Summer, about the meaning behind my three favorite songs. Avary said that it in fact is about marriage and touring. The colors allude to the skies in the cities where they toured. The lyrics capture the struggles of the gauntlet that is long nights on the road, but being blessed to do it with his wife. He also mentioned how hard it was for him to look back and think about a song he wrote nearly seven years ago and always remember exactly what it meant to him at the time. “Ashes Made of Spades” (Life Will Write the Words) – Finally, although the meaning is a little more obvious, I had to ask him about my favorite Rocket Summer song. He said “Ashes Made of Spades” is about the “power of the Holy Spirit” (which is fairly clear in the lyrics) and that the “ashes made of spades” are a metaphor for the cards your dealt in life being set aflame and overcome through the power of the Holy Spirit. So I’d say I was pretty close on that one, but to confirm it first-hand was very cool. I told him I enjoy listening to that song on the way to Church most Sundays, and I’ll enjoy it even more now. The Rocket Summer had a contingent of groupies who he had gotten to know personally. They were mostly Columbia, SC people who had followed him around on his East Coast stops. Who knew he had groupies? Anyway… be sure to check out the Rocket Summer on Spotify, he has a fairly extensive discography, and it’s all on there. One of the opening acts was Royal Teeth, a new energetic group from New Orleans. They only have an LP thus far with the full album set to release this coming summer. The best song on the LP is one called “Wild” which they are giving away as free download here. I had listened to it a few times before the concert and enjoyed it, so I asked him if it was about what it seemed, a young romance. The lead singer of Royal Teeth said it was originally about just that, but it slowly evolved during the writing process and now the playing process to be about “giving up your real job to do ‘this'” (referring to touring with a start-up band). The evolving meaning of a song to its own writer was something I had never considered and find very cool. It prompted me to wonder and ask if bands, and Royal Teeth in particular, intend to leave their songs open to interpretations. He told me that they do try to write lyrics that are clear and specific enough to communicate their message, but they also want to leave it open so it resonates with each listener’s own life and what they’re going through. So while the broad message remains the intact, it can take on a different interpretation to mean something special for each individual. Anyway, the Royal Teeth were very good, so be sure to get their free download, I mean, it is FREE so download it now and enjoy.